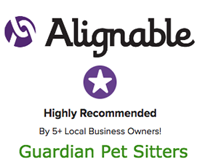 Guardian Pet Sitters® is one of the first pet sitting companies to offer a “Peace of Mind Program” to pet owners. We know how important pets are to our clients; pets are members of the family. It is important for pet owners to know if something was to happen to them the pets would not be forgotten. You don’t have to have visits scheduled, we are on call for you 365 days. We never know when life will happen and Guardian Pet Sitters® is there for you and your pets when the unexpected happens. What if I was injured or became suddenly ill? Who knows I have pets at home that need care? Do I want family members or friends worrying about the pets when they want to be with me? 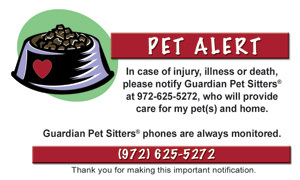 With Guardian Pet Sitters® “Peace of Mind Program” you know that your pets are being provided the necessary care and attention if something was to happen to you. 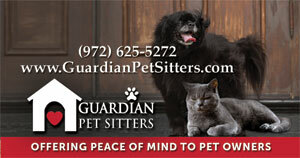 You enroll in our “Peace of Mind Program” at the time you become a Guardian Pet Sitters® client. A “Pet Alert” key tag to carry on your key ring. Our “Peace of Mind Program” is available in all of our service areas: North Carrollton, Frisco, Northwest Plano, and The Colony, Castle Hills. The first visit is complimentary! We value being there when you need us! 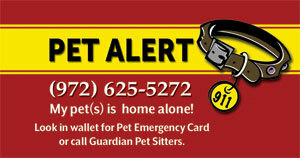 *A good place to carry the pet alert card is behind your driver’s license.